LISTEN: Before Obama Was President, In His Own Words On NPR NPR listeners first heard Barack Obama in the 1990s before he became a politician. 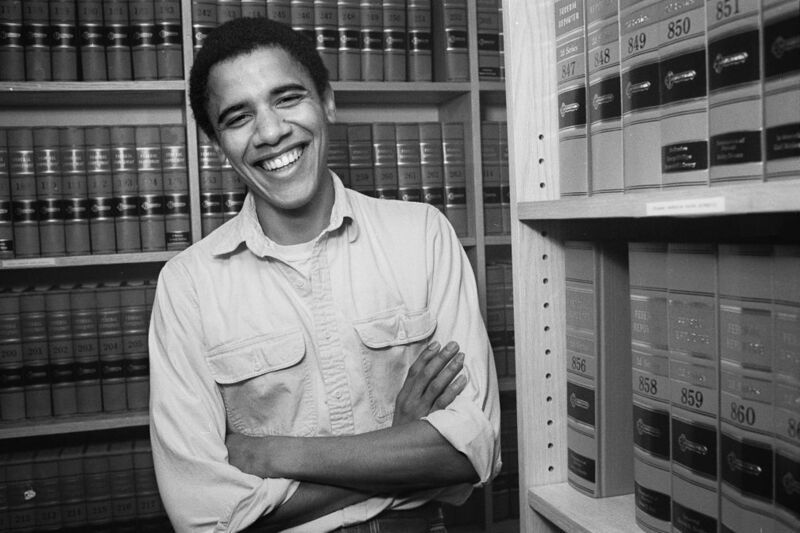 Here are some of his earliest appearances as the first black president of the Harvard Law Review and as an activist. Barack Obama, graduate of Harvard Law School '91, is shown here on campus after he was named head of the Harvard Law Review in 1990. In 1990, Obama was still a student at Harvard Law School and had just become the Harvard Law Review's first black president when he was interviewed on Morning Edition. At the time, Obama was 29 years old. He had worked for a few years as a community organizer in Chicago, before going to law school. "I'm very interested in helping to rebuild inner-city communities in the country. ..."
By the summer of 1992, Obama had gotten involved in politics. He was the state director of Illinois Project Vote. Bill Clinton was campaigning for president, with Hillary Clinton at his side. Meanwhile, Obama was 30 years old, and working on voter registration. Even in the 1990s, Obama was talking about something he references a lot now: getting people involved in politics and invested in institutions. Another theme in these appearances: Obama talking about issues of race. It's something he grappled with in his memoir, Dreams From My Father, and in this commentary on All Things Considered in October 1994. In it, he criticizes the book The Bell Curve by political scientist Charles Murray and psychologist Richard J. Herrnstein. That book was controversial for the way it linked race, genetics and IQ — and Obama called it "dubious science." Obama argued that the country needed to invest in public schools and good-paying jobs, and provide what he called "real opportunity" for black children. Exactly 14 years after that commentary aired, Obama was campaigning in Pennsylvania. He was one week away from being elected the country's first black president.